The dramatic increase in internet-connected devices has created a significant attack surface for hackers and cybercriminals. Applications for the Internet of Things (IoT) are growing. As a result, the related challenges associated with IoT data security and privacy will increase with time. Whether their motive is simply mischief, theft, or some other goal, the impact of IoT-related criminal activities can be far-reaching and very costly. Vendors of cybersecurity software and services will, therefore, experience growing demand for their offerings. 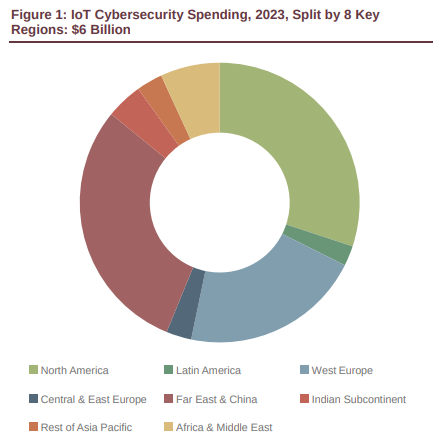 According to the latest worldwide market study by Juniper Research, spending on IoT cybersecurity solutions is forecast to reach over $6 billion globally by 2023. The analyst has highlighted rapid growth, with spending by product and service providers (in consumer markets) and end-customers (in industrial and public services markets) to rise nearly 300 percent over the forecast period. Juniper also claimed that the growing business risk and increasing minimum standards set by new government regulations would serve as key spending drivers for new IT infrastructure investment. Juniper believes that there are major differences in the way in which IoT business risk is perceived and perceptions on how regulation should be applied. Juniper cited the home as an example of where poor long-term device support and little fear of ramifications in case of a breach would serve to keep spending low. "The interconnected nature of the IoT means that even innocuous devices like the connected refrigerator can become a threat. Vendors see that risk as low, while little has been done from a regulatory perspective to protect consumers," said Steffen Sorrell, senior analyst at Juniper Research. As a result, Juniper forecasts that smart home IoT security spending would be less than 17 percent of the consumer market in 2023. In contrast, the research identified glaring security issues in the smart energy market. However, it noted that strict minimum standards, such as those applied by Germany and the EU’s General Data Protection Regulation (GDPR), would drive spending impetus, with IoT smart energy security spend reaching $1 billion annually in 2023. The research forecasts that the rise of edge computing services to enable near-real-time IoT applications would present additional security challenges, which in turn will drive industry investment in cybersecurity technology. It cited an increased attack surface as raising business risk. Meanwhile, the need to ensure data reliability would emphasize the need for lifecycle management and IoT device security solutions.